...born in 1918 early became active in the Romanian Communist movement and was arrested as a revolutionary; he spent the late 1930s and early 40s in prison, where he became acquainted with the future first secretary of the Romanian Communist party, Gheorghe Gheorghiu-Dej. 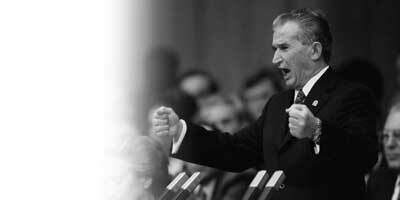 Escaping in 1944, Ceausescu held a variety of posts within Communist party and government ranks after the Communist takeover in 1948. He soon became a member of the party's central committee and then, in 1955, a member of the politburo. Upon Gheorghiu-Dej's death in March, 1965, he was chosen first secretary of the central committee of the Communist party and in December, 1967 he assumed the office of president of the state council, or head of state. As supreme leader, he continued his mentor's policy of nationalism and independence from the USSR within the context of Marxism-Leninism. He promoted closer relations with the People's Republic of China and with the West, as well as industrial and agricultural development. His domestic rule, however, was marked by frequently disastrous economic schemes and became increasingly repressive and corrupt. In December, 1989, a popular uprising, joined by the army, led to the arrest and execution of him and his wife, Elena.